Keep your roses flowering and looking tidy by learning ‘How to Deadhead Roses’. 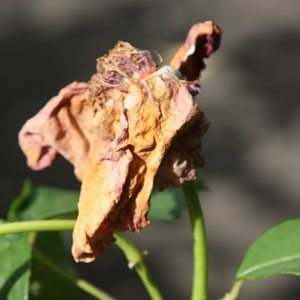 This is simple process, deadheading roses fulfils two purposes, firstly to encourage some roses to re bloom, and secondly to ‘tidy up’ roses by removing the old spent flower head. 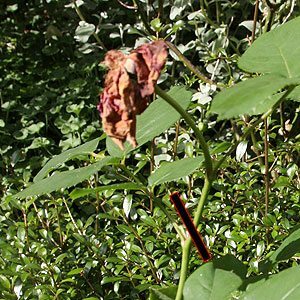 Why does deadheading help promote re flowering ? By removing the old flower heads you are also removing the ‘rose hips’ these are the parts that hold the seeds if the rose have been pollinated. If left on the plant they release hormones or a signal that tell the plant that ‘it’s time to produce seeds’ rather than ‘it’s time to flower’. So deadheading encourages energy in the plant to go to growing areas of the plant and therefore encourages better new or repeat flowering. Gardening gloves, prevents scratches from thorns. Look down the stem from the spent rose head to a place where 5 strong leaves are growing any less and the new growth can be ‘non flowering’. Look for an outside facing bud, this encourages more open growth. Cut at 45° angle so that rain runs of the cut. Cut a little less than 1/4 inch ( 1 cm) above the union. 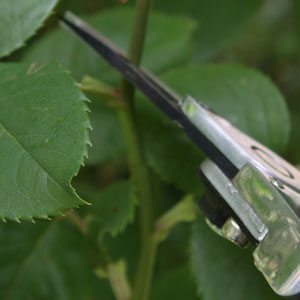 While you are at it remove any dead or damaged growth, weed around the rose and check the mulch.